What food to eat and avoid for treating Malaria, Indian Diet for Malaria. Malaria is a disease caused by the transmission of Plasmodium parasite transferred by female Anopheles mosquito. When an infected mosquito bites a healthy person, it transfers the parasite into his/her body. This parasite travels to the liver and multiplies. After a few days they are then released into the blood stream where they start attacking the red blood cells (RBC). Other causes of malaria are from pregnant women to unborn child, through blood transfusions and by using sharing needles for blood tests or injections. Malaria can be life threatening in extreme cases. It can cause complications like failure of liver or kidney, Anemia due to destruction of RBC, Cerebral Malaria if the cells have reached the brain, breathing problems if the lungs have been attacked or even low blood sugar. Of course, Malaria is a disease which has to be treated with medications depending on the person infected. However a few dietary measures will help you sail through this disease with ease. Since the person’s immune system is attacked by the parasite, the main focus should be boost immunity and enhance the ability to fight disease while not putting any extra load on kidney, liver and digestive tract. 1. Hydrate yourself well with boiled water. Coconut water is equally beneficial. Try Coconut Water with Coconut Meat. 2. Drink plenty of juices like orange juice and grapefruit juice in the initial stages. This should be followed by other fresh fruits like strawberry, sweet lime, kiwi, grapes, papaya, melon, berries, pineapple etc. They help you rejuvenate and build immunity too. Papaya Pineapple Juice, Pear and Pomegranate Juice and Muskmelon and Orange Juice are some tried and tested recipe ideas. Once you have recovered a little, prefer whole fruits to gain the utmost nutrient benefit. Try Pear and Pomegranate Salad then. 3. Opt for a variety of soups too. They are quite pleasing to the system. Try recipes like Broccoli Broth and and Carrot and Bell Pepper Soup. 4. Once you are recovering follow a balanced diet of whole grains, fruits, vegetables and healthy nuts like walnuts and almonds in moderation. 5. Amongst the vegetables prefer Antioxidant rich veggies like Broccoli, Capsicum, Cabbage, Carrots etc. They work towards building a strong immune system. Vegetable and Basil Soup and Vegan Salad are classic examples of how you can cook and serve antioxidant rich recipes. Sometimes even a simple delicacy like Dahi Bhindi ki Subji is also very soothing and pleasing. 6. During fever concentrate on simple, non-spicy foods which gives enough carbohydrate and protein like rice porridge and complete protein like Moong Dal Khichdi. 7. Try to add steam veggies with not too much spice and oil to your daily diet. You can also add easily add veggies to your bowl of khichdi like done by us in recipes like Masoor Dal and Palak Khichdi. 8. Dals and pulses also should form an important part of your diet. They are very much necessary to make up for the tissue loss. Try wholesome recipes like Hearty Red Lentil Soup and Urad dal and Vegetable Appe. 9. Focus on protein as it’s required in the synthesis of immune bodies. Prefer curds, buttermilk or Salted Lassi . Consume milk in moderation if it suits you. 10. Add omega-3 to your diet by way of flax seeds, walnuts, chia seeds as this helps to reduce inflammation in the body. One of the most easiest way to add omega- 3 along with protein to you diet is by way of Flax Seed Raita. 11. Once you have recovered to some extent, do not miss out on adding greens to your diet as anemia may persist. Try recipes like Methi Paratha and Ragi and Corinader Uttapa. 12. Do not include high fibre whole grains in huge quantities in the beginning. Focus more on fruits, vegetables, water and electrolytes. In advanced recovery stage follow a balanced diet of whole grains, fruits, vegetables and healthy nuts like walnuts and almonds in moderation. Try one dish meal like Nourishing Oats Moong Dal and Vegetable Khichdi. 13. Add spices gradually to your diet. We have listed what foods to avoid during malaria. Here are a few of our tested recipes to help you recover from Malaria soothingly. 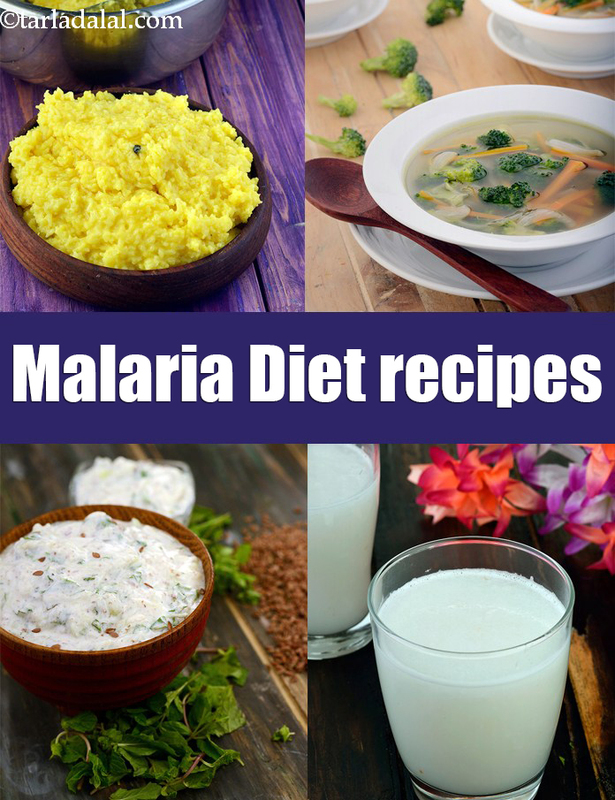 Enjoy our What food to eat and avoid for treating Malaria, Indian Diet recipes for Malaria below.